The best part? Whether Dad would make us breakfast or not (his famous French Toast! 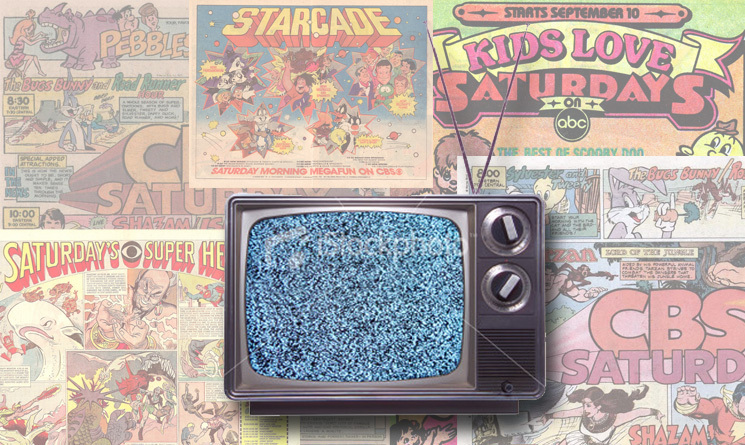 ), the even better part of my Saturday mornings growing up was plopping myself down in front of our TV to watch cartoon after cartoon! You know, the kind that were only on once-a-week and not available in an instant through Netflix or Hulu? I thought about that recently and decided it might be cool to come up with a new weekly tradition of sorts for us Lutheran adults to enjoy each and every Saturday morning now that we're all grown up (ok, at least some of us more than others anyway). I mean, isn't it time for us to look forward to Saturday mornings again? Besides, it will be good for us to recall that childlike faith in fun and laughter if only for a few moments each week. You'll remember that laughter was, for Luther, a sign of divine grace and also an antidote against the devil too. From the very beginning, humor had been a theological topic for Martin Luther, embracing the dramatic scope of his whole world view. He himself explained: "When I was unable to chase away the devil with serious words of with the Scripture, I often expelled him with pranks." As a result, this unique concept was born! Ok, so it's really not all that "cool" or "original" or "fun" to be sure, but it will be our new tradition here, and I'll try to make it worthwhile too. So who's with me then? Please keep in mind, it won't be flashy, and it will hardly grab and hold your attention like a classic episode of the Care Bears, G.I. Joe, Thundercats, or Voltron would, but these "Lutherandom Musings Along Memory Lane" should satisfy the Confessional Lutheran's appetite for a balanced breakfast that includes your VDMA Vitamins which include Vitamin A (Amusement), Vitamin B (Best of the Blogs), Vitamin C (Confessional), Vitamin D (Doctrine), and Vitamin E (Everything Else). Each Saturday morning, God willing, I'll do my best to share some of the things I remember coming across in my unpredictable journey through Cyberspace during the week (hence, the "Along Memory Lane" part). For the most part, these will be things I either bookmarked, read, wrote down, and/or simply couldn't get to myself during the week. Of course, this is also where the things you send me via email (if any) will show up too. Ok, enough with all the "commercials" when all we want is some "cartoons," right? Let's get the show started already, shall we? 8:00AM DOSE OF VITAMIN A (AMUSEMENT): Tomorrow's Super Bowl LII. I'm willing to bet that each and every one of us knows at least one guy at church who just has to tell everyone he comes into contact with this week that he could care less about football and the sport's biggest game of the year, and that he'll be the only pious person who's not watching. Oh, and shame on you for tuning in! All kidding aside, it reminded me of this piece from The Babylon Bee published last year at this time titled "Local Christian Loudly Proclaims How Little He Cares About Super Bowl" that acknowledges this annual occurrence with humor and wit. Don't be like Randy Bedford. 8:30AM DOSE OF VITAMIN B (BEST OF THE BLOGS): As we quickly approach Lent this year, I've already started looking for some some new material to prayerfully consider and share with all of you. Thankfully, I just found a wonderful Open Letter from Pastor Scot Kinnaman titled "The Discipline of Lent" in which he was responding to another Lutheran who seems to despise this annual season repentance (like far too many Lutherans these days it seems). To echo the Pastor's closing words here, "And to you too, dear blog reader, my prayer is that you have a blessed Lent and a joyous Easter celebration." 9:00AM DOSE OF VITAMIN C (CONFESSIONAL): Sometimes we need a simple reminder: "Therefore, we did not present this common Confession briefly or merely by signing our names, but we wanted to make a pure, clear, distinct declaration about all the disputed articles that have been discussed and argued among theologians of the Augsburg Confession. We did this so that everyone may see we do not want to hide or cover up all this in a cunning way, or to come to an agreement only in appearance. We want to remedy the matter thoroughly, and wanted to set forth our opinion on these matters in such a way that even our adversaries themselves must confess that in all this we abide by the true, simple, natural, and proper sense of the Augsburg Confession. We desire, by God's grace, to persevere constantly in this confession until our end. And as long as it depends on our ministry, we will not overlook error or be silent, lest anything contrary to the <genuine sense of the Augsburg Confession> is introduced into our churches and schools, in which the almighty God and Father of our Lord Jesus Christ has appointed us teachers <doctors> and pastors." (Solid Declaration of the Formula of Concord XII 4-6). 9:30AM DOSE OF VITAMIN D (DOCTRINE): I would caution you to please prayerfully consider what it is you're opening up your mind up to, because it's usually left up to each individual to decide what influences they allow into their lives on a daily basis, and I would assert that so much of what we think is "just entertainment" or "harmless and meaningless fun" is actually nothing but dark, demonic, and pure evil. Don't worry, I'm not the Christian who's about to advocate that no one should ever watch another movie or TV show ever again, but I do want to call attention to something I think a majority of Christians never think about. Satan is real. Demonic beings loyal to him are real. I know there will be many Christians reading this who will tell me I'm completely nuts. I have one dear family member in particular who I know feels that way. Some might even go so far as to say that there's no such thing as a spiritual realm at all that contains demonic, Satanically-inspired entities bent on damaging and destroying us. They say this with a straight face despite what 1 Peter 5:8 and 2 Corinthians 11:14 warns us. Let's take a quick look at those passages though. 2 Corinthians 11:14-15 (ESV) "And no wonder, for even Satan disguises himself as an angel of light. So it is no surprise if his servants, also, disguise themselves as servants of righteousness. Their end will correspond to their deeds." My Lutheran Study Bible points out that because sinful people still know the difference between right and wrong, the evil one seduces them into his camp by making wicked deeds appear good. Satan cloaks naked evil in attractive garments. Why does he do this? 1 Peter 5:8 (ESV) "Be sober-minded; be watchful. Your adversary the devil prowls around like a roaring lion, seeking someone to devour." Satan seeks to harm Christians in any way possible. The devil "tries every trick and does not stop until he finally wears us out, so that we either renounce our faith or throw up our hands and put up our feet, becoming indifferent or impatient" (Large Catechism V 26). 10:00AM DOSE OF VITAMIN E (EVERYTHING ELSE): So, yoga has been in the news a lot this week. First, it was Tucker Carlson getting into a debate in response to the assertion that "Yoga causes White Supremacy" here in America. Then, it was Catholic blogger, Matt Walsh, who boldly proclaimed his stance against Christians practicing yoga, which ignited a backlash from believers on social media. Newsflash: I actually agree with Matt Walsh on this one and have for years -- so does our Synod too since they also caution Christians against the practice. Please check out "'Christian Yoga' Takes A Punch To The 'Core'" for a comprehensive overview of yoga from a Christian and distinctly Lutheran perspective. This is why I find the label "Christian Yoga" a true oxymoron. If anything, it's more like a classic "Trojan Horse" instead, and I just worry that those who get involved with it and then regularly do yoga thinking it's "harmless" exercise might actually be harming themselves emotionally, physically, and spiritually just as that one medical, scientific, and non-religious study cited in my hyperlink documented. For those reasons, is it really wrong for someone like me to ask if a person's soul could be at stake just because they want to exercise their right to exercise as they see ﬁt? If it is, then dare I also ask, what's more important in that case? Exercise or eternity? I get this is a controversial topic for most. I will end by sharing a tweet I received the other day and would love to get your thoughts on this in the Comments Section below. This person said: "While 'all things are allowed' in the freedom of discipleship, there are still those who are of such weak faith, that they will only see an evil intent, even when there is no evil intent. God knows the heart." For what it's worth, my position on this subject still hasn't changed though, because I've seen what Yoga, Kundalini, and Reiki can do to people. So, if you really want to meditate, then please practice the kind of "meditatio" that Martin Luther encouraged. In a Lutheran Layman's terms, you've been fed a balanced spiritual diet this morning so I hope you're full and wide awake and ready to face the day in your God-given vocations.